Shooting this with a close-up filter did present its own unique set of challenges, and also dramatically altered some key elements of the image when you compare it to the first one. For one, the subject appears dramatically larger simply because I was able to get so much closer to it. 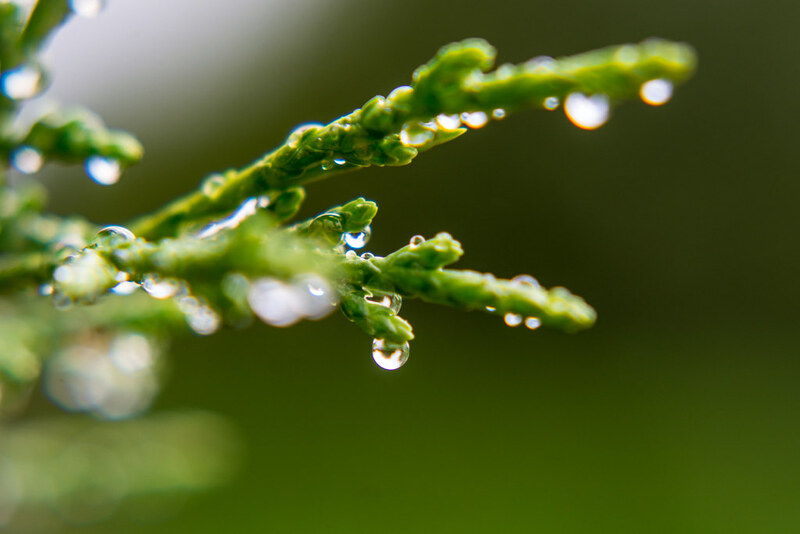 The depth of field is markedly shallower as a result, and the image takes on a more intimate feel whereas the first one seems like the droplet is part of a much larger scene. The leaves of this bush that you see here are much smaller than the leaves of the tree in the original image, and while none of these characteristics makes the picture inherently better it is interesting to see how the close-up filter has such a dramatic effect on things. In fact, when I compare the two side-by-side I almost prefer the original because it feels like a more complete composition and also has the benefit of showing a few streaks of rain, whereas in today’s picture the focus is clearly the droplet and almost everything else is secondary. There isn’t much in the way of a rest of the scene, as it were. It’s not good or bad, it’s just different. I think this speaks to one issue with which I continually struggle when it comes to photography: the desire to always try something new and different. I mentioned several weeks ago in pictures of a squirrel and a duck that I felt like these types of images were almost cheap because they are not all that difficult, given that I work about a block away from the pond on campus where these animals congregate daily. In a similar fashion today’s picture requires nothing special at all other than a bit of rain, and even that could be faked with a spray bottle and some tap water. And so after taking a picture of a rainy leaf, a duck, or a squirrel I often think of it as an item on a checklist that has been completed, never to be revisited. However, this type of thinking is entirely incorrect! If you like taking pictures of something, keep doing it! No one says you can’t, and just because you got a shot of a beautiful sunrise, your kids playing in the sprinkler, a bolt of lightning, or anything else you were aiming for, doesn’t mean you should stop there. Do it again, and again, and again and see what you can learn from the experience. Far from being the stopping point, these pictures should be the starting point of a photographic journey. I think this image is quite lovely and I like the change in depth of field. I have to comment on your “Almost Cheap” statement as I believe whatever you shoot is what’s caught your fancy for the day and it’s all good. Thanks for the permission- to take another picture of the same thing. Sometimes we photographers are looking for the next latest and greatest photo. I am reminded once again that a major part of what makes a better photographer is – practice, practice, practice! 1. It’s impossible to take the same photo twice. Every photo is different and unique. Thanks for the encouraging words Lisa! And I shall name this one, dew drops on the Asparagus! Lovely photo. Water’s gentle side – life giving. As someone just starting to explore photography I have no illusions that I’ll come up with an idea to shoot something that no one else has ever captured before. But I will learn what speaks to me, and through repetition, hopefully improve technique. Thank goodness for ever changing conditions, since I’m often pressed for time and need to find something to capture right at home. I have already taken photos of the same tree multiple times in varying light conditions. Water droplet photos do abound, but these droplets presented themselves to you, and you were aware enough to capture them. The subject category may have many examples, but these were yours…and then you shared them with us. Thank you. Kyla, I’m so glad you posted a comment on here as someone who is just getting started out on her photographic journey. Few things inspire me more, when it comes to photography, than seeing others learning this craft for themselves. I like your idea of taking pictures of the same tree in different lighting conditions! That’s a fun and interesting challenge and just goes to show that even things that might seem like normal, everyday images can be very different depending on something as simple as the time of day.